On Friday 7th August 1914 - three days after the outbreak of war - crowds lined the streets of Accrington to watch 100 khaki-clad men of the Accrington Corps of the St. John Ambulance Brigade march from the Drill Hall at Bull Bridge to the railway station. The Accrington Observer & Times reported the following day that as the train left for Euston at 10.35am "there was much waving of arms and hats and handkerchiefs from the carriage windows, and shouting of departing words. There was a hearty response from the crowd, both vocally and by waving of handkerchiefs and hats. Then as the train got up speed there was a general cheer. It was a hearty send-off, although there were sorrowful faces among the womenfolk and not a few tears." 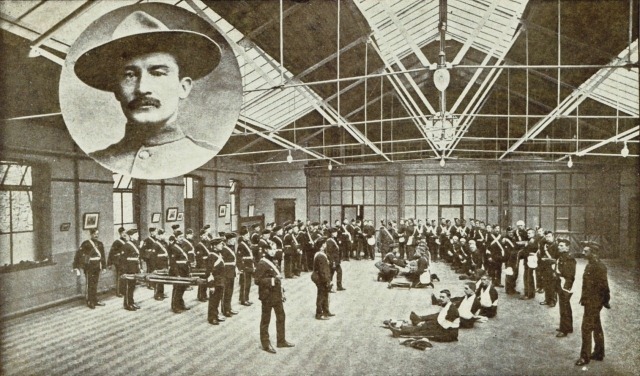 Above: The Accrington Corps St. John Ambulance Brigade at Drill in the Drill Hall, Bull Bridge, Accrington. Photograph by kind courtesy of Dave Whitehead. The Accrington Corps of the St. John Ambulance Brigade had its origins in first aid classes organized by Major William Nutter1 and Dr. Robert Ruttle2 in 1884. When it moved into the Drill Hall in 1904, the Accrington Corps was said to occupy the finest headquarters in the whole country. By 1914, the Brigade formed a key element of the British army's reserve forces: in the event of war, its members were to be mobilised and would take the place of regular staff of the Royal Army Medical Corps at military hospitals in Great Britain. So it was that the Accrington 100 were sent via Euston to Netley Hospital near Southampton where they attested to serve for a period of six months. The six months period of army service came to an end for the Accrington 100 on 6th February 1915; a few, including Arnold Bassinder, a 21-year old labourer at a print works, accepted a discharge in order to re-enlist a few days later in the Accrington & Burnley Howitzer Brigade. At least 47 however chose to remain with the R.A.M.C. and saw service overseas. Above: Elizabeth and Robert Slattery with their daughter, Bessie. Photograph by kind courtesy of Dave Whitehead, grandson of 25107 Robert Slattery. One of those who remained with the R.A.M.C. was Robert Slattery. Robert had first enlisted into the Army as an 18-year old on 12th December 1892, joining the 2nd Bn., The Loyal North Lancashire Regt. ten days later at Enniskillen. In January 1896 he was posted to the regiment's 1st Battalion in Ceylon, where he remained for a little over three years before his battalion was sent to South Africa. As a result of his service in the Anglo-Boer War of 1899-1902, Robert was awarded the Queen's South Africa Medal with three clasps (Defence of Kimberley, Orange Free State and Transvaal) and the King's South Africa Medal with two clasps (South Africa 1901 and South Africa 1902). He returned to the United Kingdom in September 1902, and was discharged on completing his twelve years' service on 11th December 1904. 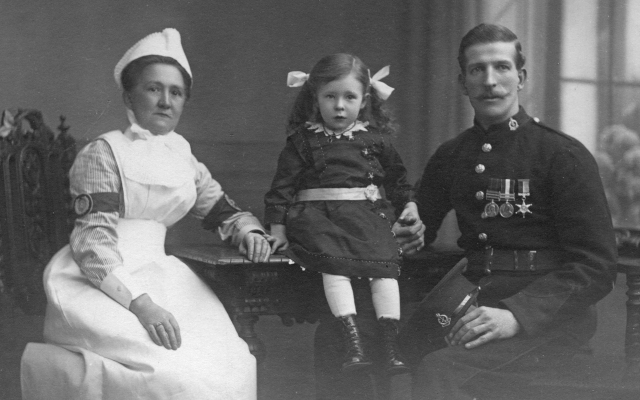 On returning to civilian life, Robert became actively involved in the St. John Ambulance Brigade alongside his future wife Elizabeth Pickup, whom he married at Accrington on 4th February 1911. At the outbreak of war on 4th August 1914, Robert was an inspector with the tramways department of Accrington Corporation, as well as a Sergeant Major in the Legion of Frontiersmen. After opting to remain with the R.A.M.C. after his six months' service at Netley ended on 6th February 1915, he served at Aldershot before being posted to Egypt early in February 1916. Having served as a Nursing Orderly and Surgical Ward Master, he was promoted shortly after arriving in Egypt to Sergeant and, in July 1917, to Staff Sergeant. Robert is known to have worked at No.12 Egyptian Stationary Hospital and No.17 Prisoner of War Hospital before the war ended in November 1918. As well as being mentioned in dispatches by Sir E.H.H. Allenby, he was recommended for the D.S.M. on four occasions. While Robert was serving in the Middle East, his wife Elizabeth instructed countless recruits in first aid and worked as a volunteer at Baxenden Military Hospital and Elmfield Hall. 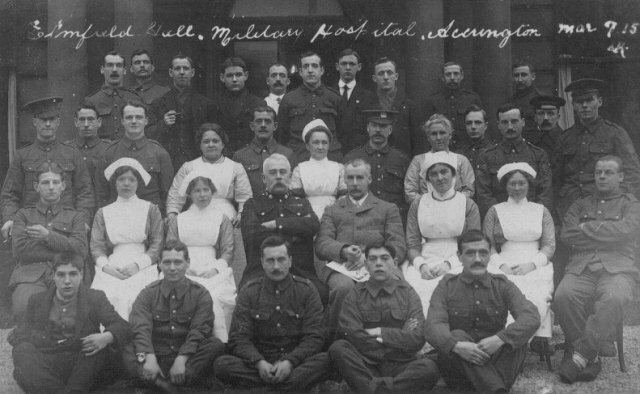 Above: Mr. Gatty, Dr. Clegg, staff and patients at Elmfield Hall Military Hospital, Accrington in March 1915. This photograph was on a postcard sent to Victor H. Gatty on 4th June 1915. Fourth from the left in the second row is Dr. Richard Clegg (in uniform); fifth from the left in the second row is Mr. Gatty, thought to be Albert Gatty who was to donate Elmfield Hall to Church U.D.C. in 1920; in the centre of the middle row is Elizabeth Slattery, wife of 25107 Robert Slattery. Sidney Matkin, chauffeur to the Gatty family, is standing second from the right (with cap and moustache). Photograph by kind courtesy of Steve Williams and Brindle Historical Society. Robert remained in the Middle East, serving at No.7 Prisoner of War Hospital and the Russian Hospital at Tel-el-Kebir, until he was posted back to England in July 1920 for demobilization. Although he returned to work with the tramways department, he died aged 47 on 25th July 1921 from pneumonia and heart failure brought on by malaria caught on active service. © Andrew C Jackson 2008. Compiled from various issues of the Accrington Observer & Times, "God and the British Soldier" by Michael Snape (Routledge, 2005), the army service records of Robert Slattery, and with the kind help of Dave Whitehead.